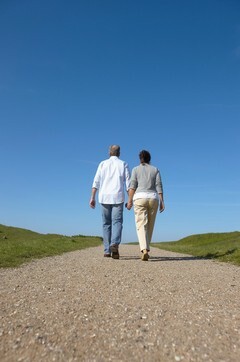 Naturopathic Specialists Blog - Start Walking to Feel Better Now! Start Walking to Feel Better Now! Do you want to lose weight, boost your energy or just stay active? Walking could be the way for you. Walking is a fun way to exercise that doesn’t involve equipment, a gym membership or workout apparel. Put on a pair of comfortable shoes and get moving! It is good for your attitude. Want a quick mood boost? Take a walk! Exercise releases endorphins3, feel good chemicals that reduce stress and enhance your mood. Plus, you’ll get a surge of energy. Set a goal.Your goal depends on your health and activity level. If you’ve been fairly sedentary, start small and try to walk 10-15 minutes a day, several times a week. If you are more fit, challenge yourself with a more frequent regimen or longer distance. Count your steps. A pedometer measures how many steps you take during the day. Wear a device to track how many steps you are taking. Use an app to journal your progress. Whenever you walk, record your time, how many miles you walked, how you feel and other useful information worth monitoring, such as your heart rate or weight. Tracking your progress will help you stay motivated. You can do this wearable health trackers or through an app on your phone. Enlist the aid of a partner. Walking is more fun with others. Invite your spouse, neighbor, friend or children to join you. Not only will you have someone to chat with, you’ll also have someone who will hold you accountable to your new routine. Keep boredom at bay.To break up the monotony of an all-too-familiar route, go to a local park or hit a hiking trail. The change of surface will make it more engaging and may enhance your workout. Stay safe while you are walking. Want to start walking but need a bit of help? Let us help motivate you to get moving with NSactive, our new digital health program designed to get you active. To learn more, give us a call at 480.990.1111.